Alexandre Darracq co-founded the Gladiator Cycle Company with Paul Aucoq in 1891 in the northeast part of Paris. Gladiator became part of the tangled mess of companies that came into contact with Adolphe Clement. So here it goes: in 1896, Clement bought out Gladiator from Darracq (who then went on to other automotive endeavors) and renamed the company Clement-Gladiator. Cars came around 1901 (and motorcycles from 1902). In 1903 there was a split and Clement-Talbot became its own thing, while Clement-Gladiator remained in France. All shaft-driven cars were badged Clement-Gladiator after this point, while chain-driven cars were just called Gladiators. In 1907, all cars became Gladiators after the company was taken over by Vinot et Deguingand. The brand disappeared after 1920. This chain-drive Gladiator was produced during the Clement years and is powered by a 1.7-liter twin-cylinder Aster engine making 10 horsepower. The current owner acquired it in 1990 and had the engine rebuilt. It’s been used extensively on the London-to-Brighton run (and we mean “extensively” – it’s completed the run 24 of the 25 times it’s attempted it) and the coachwork is original, but may have had some restorative work done to it long ago. It’s a great old car, and should bring between $160,000-$200,000. Click here for more info and here for more from this sale. 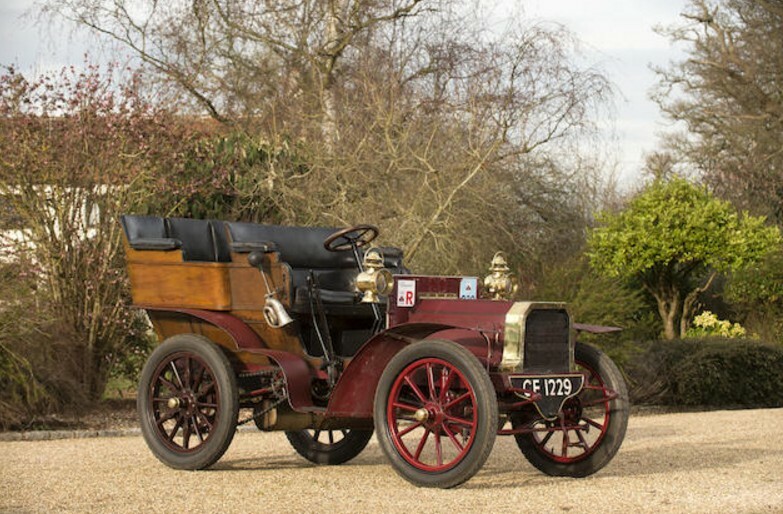 This entry was posted in Uncategorized and tagged 10hp, 1903, 2-cylinder, auctions, Bonhams, cars, classic cars, gladiator, rear-entrance tonneau by classiccarweekly. Bookmark the permalink.